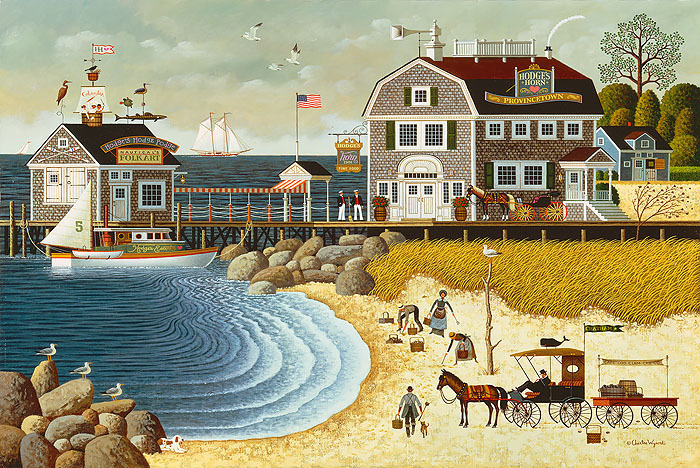 "In the early 60s, we took our first trip to Cape Cod. Driving along a sandy road to Provincetown, we stopped to walk the beaches in various towns and were surprised to see so many clam diggers looking for their evening meal. "This cove was an interpretation of that scene¯except the horse and buggy was actually a car and small flat-bed trailer and the baskets were metal pails. Not as 'romantic' as depicted in the painting and neither was the broken down old clam shack that blossomed under my paint and brush into Hodge's Inn and Restaurant."